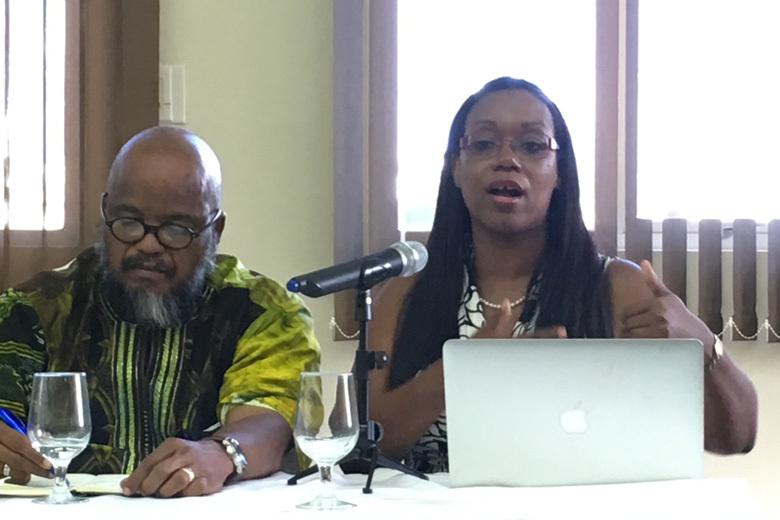 An urgent call for collaborative policy development across trade and health was one of the key messages emerging from a seminar held on Wednesday April 23rd at the University of the West Indies (UWI) Shridath Ramphal Center for International Trade Law, Policy and Services. The seminar entitled: International Trade & Health aimed to educate the public on the important intersections and linkages between trade and health as well as to explore how the two regimes can be mutually supportive. The seminar discussed issues in WTO dispute settlement including the WTO plain packaging (PP) dispute against Australia; and also commented more broadly on governments’ scope to implement strong, relevant and effective health regimes in light of their WTO obligations as well as those under the Revised Treaty of Chaguaramas and the CARIFORUM-EU Economic Partnership Agreement. Mrs. Nicole Foster, law lecturer at Cave Hill Faculty of Law and HCC International Trade Policy adviser was among the keynote speakers as well as an organiser of the seminar. The first session of the seminar addressed challenges of the intersection of treatment health and provided some background on the process used by the WTO in arbitrating International disputes. After a series of presentations in which various perspectives were presented based on past health related disputes, Mrs. Foster closed with an urgent appeal to CARICOM countries to strengthen internal policy processes to ensure that trade policy is developed in consultation with health and other related sectors. Mrs. Foster noted her disappointment that CARICOM countries, with the exception of Trinidad and Tobago, had not exercised their rights to influence the global debate around around plain packaging by participating as third parties in the dispute. Moving forward, Mrs. Foster hoped that when the PP decision was announced CARICOM countries would ensure that their voices are heard at the meeting of the Dispute Settlement Body to adopt the ruling.